Stay in one of 63 guestrooms featuring LCD televisions. Complimentary wireless Internet access keeps you connected, and digital programming is available for your entertainment. Private bathrooms with shower/tub combinations feature complimentary toiletries and hair dryers. Conveniences include desks, housekeeping is provided daily, and irons/ironing boards can be requested. With a stay at The Great Western Hotel in Basingstoke, you'll be minutes from Festival Place and The Anvil. This hotel is within close proximity of Milestones Museum and Basingstoke Leisure Park.Rooms Make yourself at home in one of the 8 guestrooms. Cable television is provided for your entertainment. Bathrooms have showers and hair dryers. Conveniences include desks and coffee/tea makers.Amenities Make use of convenient amenities, which include complimentary wireless Internet access and tour/ticket assistance.Dining Quench your thirst with your favorite drink at a bar/lounge. Breakfast is available for a fee. 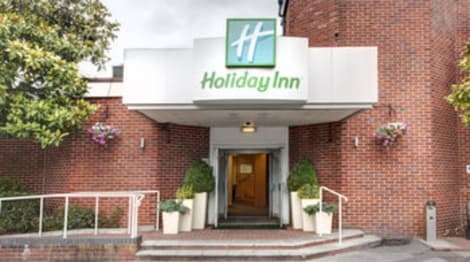 A smart Basingstoke hotel with a conference centre, All Day Dining and free parkingThe Holiday Inn® Basingstoke hotel is close to the town centre and the M3 motorway.The motorway provides easy access to London, the south coast and Heathrow Airport (LHR), a 40-minute drive away. Basingstoke station has direct trains to London Waterloo. You can host a meeting or a wedding for 150 at our Academy Conference Centre, with free parking for your guests. Nearby Viables Business Park is home to major companies like Motorola Solutions, and the Chineham and Daneshill parks are also close by. Basingstoke Leisure Park is ideal for rainy-day activities, with an Aquadrome, a cinema and an indoor skydiving centre, and you can browse 150 high-street stores at the Festival Place shopping centre. For a day out, take a tour of Windsor Castle, 45 minutes away by car.At this hotel you can enjoy:- Free WiFi- A free pass to the gym and pool in the town centre- Kids stay and eat freeOur air-conditioned bedrooms have blackout shades and a choice of pillows to help you sleep, and there's 24-hour room service. Dine on seasonal dishes or a Sunday carvery at Traders Restaurant, which is open all day, or watch a match on BT Sport over a pint in the lounge. On a bright day, you can soak up the sun in the garden. The holiday starts when you step through the door at Premier Inn Hotel Basingstoke West (Churchill Way). Set in Basingstoke Leisure Park, with an ice rink and swimming pool just a stroll away, you'll be well placed to keep the whole family entertained. And if you're here to work, we're close to key destinations like Chineham Business Park, too. Plan a big adventure at Legoland. Step back in time at Milestones Museum. Then bowl a strike and catch a movie at Basingstoke Leisure Park. After a busy day, unwind with a tasty meal in our restaurant, and kick back in your spacious room and extra-comfy bed.